Well. It's finally here. After months of waiting for the next and final part of the Matrix series to arrive, the time has come for the Masked Reviewer to give you his review. Many regular readers to the site have read the Masked Reviewer's predictions about the film, made oh-so-many months ago. Many also entered the Masked Reviewer's contest (the results of which will be posted soon on the Masked Reviewer Home Page). 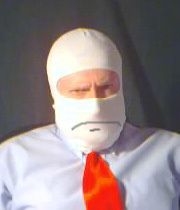 But, in keeping with the non-spoiling tradition of the Masked Reviewer, those other things won't be discussed here. The only question dealt with in this review is: is Matrix Revolutions worth seeing? You can be sure that it will get reviews in the regular press ranging from "brilliant!" to "awful! ", but most critics will give it a B and be done with it. Most critics don't care. It's sci-fi, it's an action film, and every snooty subtitle-loving bone in their noir bodies wants to run screaming from the theater. They don't get it. But, they know that people will go see this kind of film and many people will love it, so the critics have learned that it's safer to give a film that will undoubtedly be successful a good grade because then people will then love them. But the Masked Reviewer isn't about all that. The Masked Reviewer gives it to you straight, and sometimes the truth hurts. There will undoubtedly be two views on this film, and it is sure to polarize the Matrix community. Some will love it. Others, however, will absolutely hate it. The Matrix films have built up quite a large following. Many people scour the net, discussing the philosophical issues raised by the Wachowski brothers. The discussion of what it all means and how it will end spark passionate, heated debate from people who care about the franchise. Much like Star Wars or Star Trek or Lord of the Rings, there is a core audience of people who love the series and have their own ideas of how it could (or should) pan out. And, much like Star Wars, the latest film will divide the fan community. There are people who think the most recent Star Wars films (Episodes I and II) were great! However, a lot of people think they were so bad, they sullied the reputation of the original trilogy. A few fans hold out hope that Episode III will turn it all around. Matrix Revolutions doesn't turn it all around. At least they didn't call it Matrix Resolutions, because that would be the worst title misnomer since Funny Farm. There are no resolutions. The story does end, but not very tidily. Matrix films started out as sci-fi, but in Revolutions everything changes to fantasy. While there is some overlap in fan-base between sci-fi and fantasy films, the differences shine brightly in this film. In science fiction, the audience is given an explanation, based (however thinly) on real science. Fantasy deals with magic. In fantasy, pixies fly because they're magical. In sci-fi, hovercraft fly because of reverse polarized anti-grav plates. Both are fiction, but part of the fun for lovers of science fiction is the fact that it seems like, with a few attainable technological advancements, it's possible. Sci-fi deals with a possible future world, rather than a world based solely in the imagination. Sci-fi might happen, someday, fantasy won't. Matrix Revolutions is fantasy. If you read the web about possible explanations for why such-and-such happened in this-or-that way in the first two films...well...you can forget it. It's magic. Things aren't explained. The film ends, but doesn't tie up many of the loose ends, for example, why could Neo do the things he could do? What happens to the Matrix? What happens to Zion? Granted, a filmmaker isn't obliged to hand you everything on a silver platter...leaving some questions unanswered is fine. But, in true philosopher fashion, many questions are poised but not answered. That's fine for classrooms and books, but in a movie, it seems like a let down. All the intellectual discussion sparked by the first two films is likely to die quickly after this film. There are no answers. Okay. It's a life lesson. We eagerly wait for the answers, and we don't get them. Super. That'll be ten bucks for the ticket. Other people will be upset by the seeming flip-floppiness of one of the core messages of the film. For many people, though, none of this matters. They won't remember what happened in the other two films, nor will they really care about any of the philosophical mumbo-jumbo. For them, the Masked Reviewer will also point out the other aspects of the film. Collin Chou reprises his role as Seraph, the protector of the Oracle. He provides the best of the martial arts action. It's funny...you put an actual real-life martial artist in a movie and they do the martial arts well. Go figure. This film is gorier than the other two. They show a few graphic images, which might upset the easily upsettable. Mary Alice takes over in the role as the Oracle from Gloria Foster, who had the career foresight to die in 2001. There's a good amount of emotional lovey-dovey stuff, which is done rather well for an action moving and it is somewhat touching. The special effects are not a quantum leap above what we saw in Reloaded. The attack of the squiddies does have some impressive CG. It features a lot of little critters flying around, and it looks pretty good. The hand-to-hand fight scenes are okay, but by this film, one starts to feel like they've run out of ideas. A climactic fight is unabashedly Supermanny in nature. As far as Superman-style fights go, it's fine. But...has the Masked Reviewer mentioned that wirework in movies is played out? The music isn't as good as that in the first two films. This one features a lot of heavy, dramatic choral arrangements and tries to be epic and operatic in nature. The music is okay, but lacks the cool groove of some of the tracks on the first two films. There are elements from this film that seem borrowed from a variety of well-known sources, such as Christianity and The Wizard of Oz. You'll know 'em when you see 'em. One reference, in particular, just seems wacky and odd. And cheezy. You'll know it if you see it. So, who will like this film? Again, this is going to be a divisive one. But the Masked Reviewer will tell you. If you love sci-fi and aren't big on fantasy, you'll have problems with Revolutions. If you need every detail explained, like why they didn't have a bunch of EMPs built into the walls of their city for defense, or how Neo stopped the squiddies at the end of Reloaded, or what happened to the ghostly twins, then you'll go away as frustrated as many were at the end of Star Wars Episode I: The Phantom Menace. Sci-fi fans are aware of the phenomenon that the Masked Reviewer calls "Post-Cinematic Apocalyptic Ante-Revisionism". That's when you see a sequel that makes you like the original movie less, because the sequel was so bad it retroactively ruined some of the original's appeal. On the other hand, if you love fantasy and are perfectly happy with "it's magic" as an explanation, you're likely to enjoy Revolutions. If you like to have questions posed but not answered, there may be something in Revolutions to sizzle your bacon. If you just want to see a flick and don't want to think about anything, you may find Revolutions to be somewhat annoying, since there are a lot of references to the first two films (primarily the second film) that aren't re-explained for new viewers. To see Revolutions without having seen the other two Matrixes would be confusing at least. Some people might think that Revolutions is a brilliant, thought provoking, philosophical masterpiece. They might think that the Wachowski brothers are encouraging people to think about things in the films, rather than telling them what to think. However, the Masked Reviewer prefers films that make a statement about the world (or a fictional world) and then allows the viewer to think about it; that's part of telling a good story. Yes, the Matrix trilogy does wind up making some points, but not very clearly or definitively. It's like going on a long rollercoaster ride, where you're always waiting for that really big exciting plunge, but it never comes. While some will like it, others will hate it, and the Masked Reviewer, he didn't like it. What do you think? Leave feedback for the Masked Reviewer here for possible further discussion. After all, it was very early in the morning when the Masked Reviewer saw the film. Maybe he missed something. Like it or hate it, let us know! Expectation from the Title: Something revolutionary. Instead, "revolutions" refers to going around and around, like the door to a department store. Mother's Rule (Always Say Something Good About Everything): Keanu Reeves always takes good care of his hair. The Pros: They ended the trilogy. A few good action scenes. A couple of nice emotional moments. The Cons: Poor resolution, too many plot points not addressed at all, music not as good, fight scenes try to out-do the other two films but fall flat, fantasy rather than science-fiction.